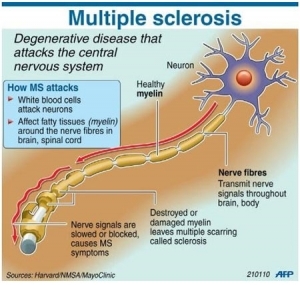 Multiple sclerosis (MS), also known as disseminated sclerosis or encephalomyelitis disseminata, is an inflammatory disease in which the insulating covers of nerve cells in the brain and spinal cord are damaged. This damage disrupts the ability of parts of the nervous system to communicate, resulting in a wide range of signs and symptoms, including physical, mental, and sometimes psychiatric problems. MS takes several forms, with new symptoms either occurring in isolated attacks (relapsing forms) or building up over time (progressive forms). Between attacks, symptoms may disappear completely; however, permanent neurological problems often occur, especially as the disease advances. There is no known cure for multiple sclerosis. Treatments attempt to improve function after an attack and prevent new attacks. Medications used to treat MS while modestly effective can have adverse effects and be poorly tolerated. Many people pursue alternative treatments, despite a lack of evidence. The long-term outcome is difficult to predict, with good outcomes more often seen in women, those who develop the disease early in life, those with a relapsing course, and those who initially experienced few attacks. Life expectancy is on average 5 to 10 years lower than that of an unaffected population. Multiple sclerosis is the most common autoimmune disorder affecting the central nervous system. As of 2008, between 2 and 2.5 million people are affected globally with rates varying widely in different regions of the world and among different populations. In 2013, 20,000 people died from MS, up from 12,000 in 1990. [ The disease usually begins between the ages of 20 and 50 and is twice as common in women as in men. The name multiple sclerosis refers to scars (sclerae—better known as plaques or lesions) in particular in the white matter of the brain and spinal cord. MS was first described in 1868 by Jean-Martin Charcot. A number of new treatments and diagnostic methods are under development.